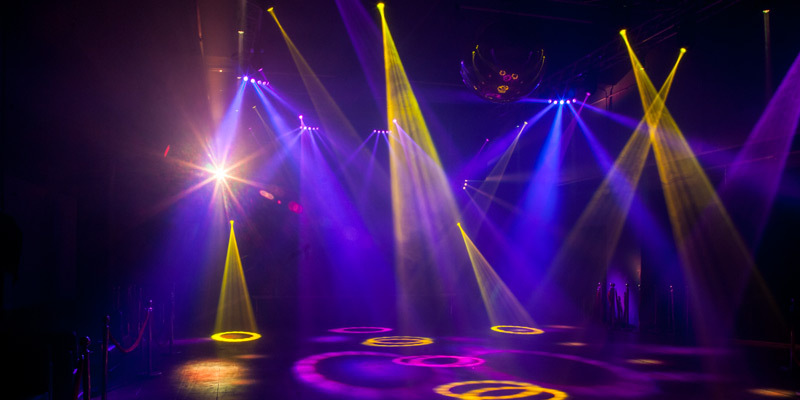 Content - ADJ Lighting & Video System Helps New LA Nightclub Aerial to Soar! ADJ Lighting & Video System Helps New LA Nightclub Aerial to Soar! Aerial Nightclub is one of the newest additions to the Los Angeles late night scene. It has a capacity of 500 and fills 16,000 square feet of space spread across a main room and an outdoor patio. Opened for the first time officially on December 31st 2017, the club is situated on the 12th floor of a commercial building south of Downtown LA, providing spectacular views of the Downtown skyline towards Hollywood from its outdoor area. When a brand new club is opened, there’s often plenty of time to allow for the décor and technical systems to be installed ahead of the official opening. But in the case of Aerial, there was a race against time! Permits for the venue weren’t granted until December 20th, giving only 10 days until the biggest party night of the year – New Year’s Eve – which really couldn’t be missed for the club’s opening. Everything had to be completed from scratch, including a complete redesign of the interior space. A new floor was laid at the same time as a Global Truss America truss rig was fixed to the concrete ceiling, which presented a few logistical issues! In the end, lighting designer and programmer Sovy Ker only gained access two days before the opening to rig, cable and program more than 60 ADJ fixtures. But he managed it in time, allowing the club to open with an awe-inspiring lightshow worthy of this impressive venue. The main room features a rectangular dancefloor with VIP tables down the two long sides and a Global Truss America stage at one end where the DJ booth is situated. Behind the booth are 24 ADJ AV6X panels, which are used to display content relating to the venue throughout the night alongside the logo of the DJ playing. The AV6X is an affordable LED Video panel that is ideal for use in clubs as well as for dance events and festivals. It has a pixel pitch of 6.0mm with a configuration of a 3-in-1 RGB SMD2121 LEDs and brightness of 1200 NITs. Flanking the stage are six ADJ Sweeper Beam Quad LED fixtures, which are mounted vertically so their beams scan from left to right across the crowd. This unique effect features eight 8-watt RGBW LEDs mounted to a motorised batten, which provides 270 degree tilt. This wide sweep angle is the reason the fixture was chosen as it provides very good coverage across the dancefloor. The Global Truss America rigged to the ceiling consists of two long pieces running parallel to the long sides of the dancefloor, together with multiple cross pieces spanning the two. The room is around 22ft high, which gives ample clearance for moving lights positioned above the dancefloor. Taking pride of place in the centre of the room is an ADJ M4040 40-inch mirror ball. This is illuminated by two truss-mounted ADJ Vizi Beam RXONE fixtures – one on either side. There are also an additional fourteen Vizi Beam RXONEs positioned around the room – five mounted on each of the long trusses, and four more on the stage. The Vizi Beam RXONE is a compact and quick moving head powered by a potent 1R HTI long life lamp that produces a super sharp 3-degree beam of light that travels up to 100 meters. This particular fixture was chosen for Aerial as it provides good coverage of the dancefloor and, thanks to its 21-degree frost filter, can be used to create both beam and wash effects. There are also six ADJ Penta Pix fixtures mounted at various points around the truss rig surrounding the stage and positioned to face out towards the crowd. The Penta Pix is a 5-head beam effect that features five 15W 4-in-1 RGBW LEDs positioned behind ACL lenses to create crisp, sharp beams. This static beam fixture is used by lighting designer Sovy to provide eye candy effects and custom chases, taking advantage of the unit’s pixel mapping feature. The long pieces of truss rigged to the ceiling also each feature four ADJ Saber Spot RGBWs, pointing downwards towards the floor, in a marked contrast to the other effects. This creative placement creates a barrier of light between the VIP tables and the dancefloor, and looks hugely effective. The Saber Spot RGBW is a compact pinspot fixture with smooth RGBW color mixing from a powerful 15W 4-in-1 quad-color LED. It has a built-in ACL lens that produces a razor sharp 4-degree beam angle. Finally, the main room features two ADJ Fog Fury Jetts positioned on either side of the stage, pointing upwards. These not only fill the room with beam-enhancing fog but also add to the wow factor of the lightshow. A high velocity fog machine, the ADJ Fog Fury Jett mixes color into the fog from 12 x 3-Watt RGBA LEDs to create impressive illuminated blasts of fog. At present, the outdoor patio features minimal production, so as not to detract from those spectacular views. However, there is a small Global Truss stage, and seven ADJ WiFLY Par QA5 WH fixtures are used to up-light the outdoor pillars. The ADJ WiFLY Par QA5 WH is a compact battery-powered wash fixture housed in a slim white casing, fitted with an ADJ WiFLY wireless DMX transceiver. This allows the fixtures to be used on the patio completely free of cables and then charged inside the venue ready for use on the next night. So far, music at Aerial has been provided by a group of passionate, local DJs and producers who love dance music, mostly covering the genres of EDM, house, and hip-hop. The management also has aspirations for the venue to become an event space – available for private functions and also as a studio environment for filming. Video shoots that have taken place in the two months since opening include artist Alyson Stoner, who amongst a varied career has danced for Missy Elliott and voiced the character Isabella for Disney cartoon Phineas and Ferb! And Ricky Palomino, who has featured as a dancer on ‘So You Think You Can Dance?’ and ‘Dancing With The Stars’. Ricky used Aerial’s main room to film a dance routine that he choreographed for a group of professional dancers.